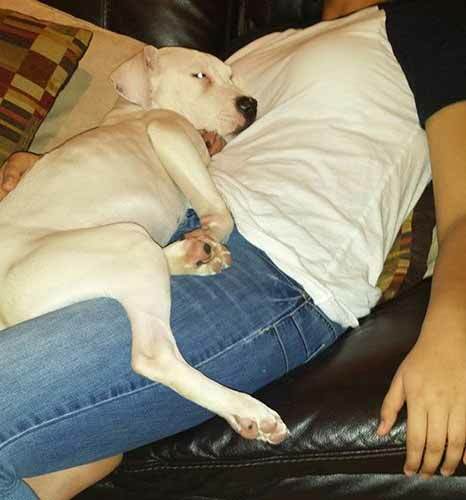 CHICAGO (WLS) -- This rescued Chicago dog is using his recovery time to become Internet famous. Herbert, an adorable 5-month-old American Staffordshire mix, is currently spending time with a foster family after being rescued from the city pound by a Chicago animal shelter. 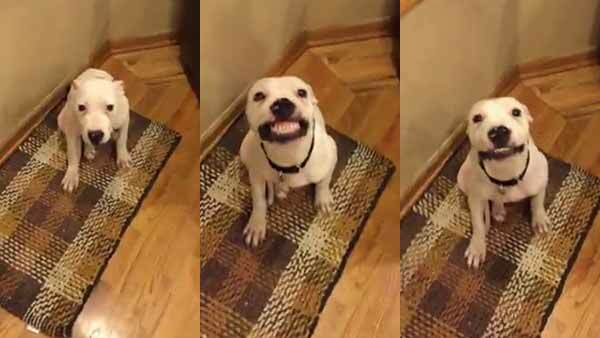 A video of Herbert "grinning" for a piece of cheese is warming hearts across the web. Sarah McDonald, PAWS Chicago spokesperson, says Herbert will be available for adoption in a week or two. Herbert contracted dog flu before he was rescued. So he's spending time in a foster home to recover. But once he's healthy, he's on the market! "While in foster, he's learning how to be a puppy, getting lots of cuddles, and working on training. Keep an eye out for him at http://bit.ly/PAWSCAdopt," the PAWS Facebook post says. The original video, posted by Herbert's foster parent Amanda Robles, has been shared more than 300,000 times and liked nearly 150,000 times. McDonald says the shelter takes in dogs with canine influenza virus (also known as CIV, or more commonly, dog flu), but must keep the dogs isolated in order for them to recover. PAWS finds foster homes for the animals in pet-free homes so they can spend several weeks getting over the illness. "What makes it so difficult for shelters is, it's so contagious for other dogs," McDonald said. PAWS runs a medical facility in Little Village where dogs can be isolated until they find foster care. McDonald said Herbert's body and behavior show he'd been confined most of his life before he arrived at PAWS. "He displayed all the signs that whatever his upbringing, he appeared to be kept in a cage," McDonald said. She said the shelter and Herbert's foster parents have been socializing him, and that he's growing less timid and building more confidence. "He's really come out of his shell wonderfully," McDonald says. This dog may be learning to be social, but he's already become a social media star. "Herbert is totally exhausted from his day of going viral. Thanks for sharing everyone. Be sure to let people know he'll be available soon!" a PAWS update says. Check in with PAWS Chicago starting next week to find out when Herbert is healthy enough for adoption.